To keep the XC60 relatively affordable, we wouldn't stray far from the base model. We'd add driver-assist safety features for more comfortable long-distance drives, though. The 2019 Volvo XC60 luxury compact crossover feels like an occasion. New last year, the headline this year for the Volvo XC60 is a more affordable, front-wheel-drive version that should appeal to sunny-state shoppers. Part of that special feeling in the crossover is its high-quality and sharp interior. It’s quiet and calm, serene and cozy without feeling cluttered. 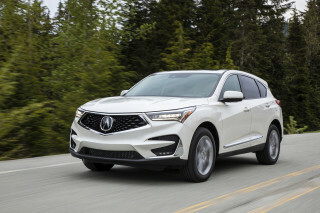 The exterior wraps a familiar shape around a smaller frame, compared to the three-row XC90, punctuated by signature headlights up front that cut a clean shape. The XC60 is available with one of three turbocharged powertrains, including a plug-in hybrid. The T5 will be the starting point for many shoppers, including those tempted by the front-drive T5’s $40,000 price tag. 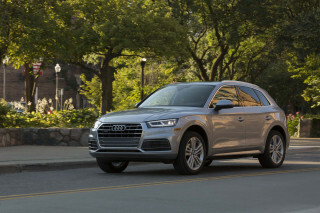 A 2.0-liter turbo-4 that makes 250 horsepower hooks up with an 8-speed automatic and front- or all-wheel drive. A supercharged and turbocharged 2.0-liter inline-4 makes 316 hp and mates to all-wheel drive only. We’ve driven this version most often, and it’s more than adequately powered. A T8 plug-in hybrid teams the same turbocharged and supercharged 2.0-liter inline-4 to a 10.4-kwh battery rated for nearly 20 miles of electric-only range. The T8 is the most efficient way to travel in the XC60, but also the most expensive. 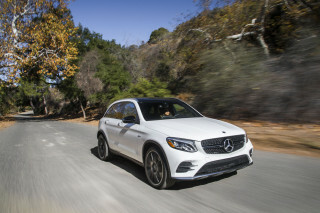 An optional air suspension upgrades the compact crossover’s ride from serene to sublime, and well worth the optional money—if it’s available. With the XC60, Volvo makes standard on all models forward-collision warnings with automatic emergency braking, lane departure warnings, and a rearview camera. Complete crash-test data isn’t yet available, but already the IIHS calls it a Top Safety Pick. The XC60 is available in Momentum, R-Design, and top Inscription trim levels, but every version is equipped with leather upholstery, power-adjustable front seats, 18-inch wheels, keyless ignition, Bluetooth connectivity, a power liftgate, premium audio, and a 9.0-inch touchscreen for infotainment with Apple CarPlay and Android Auto compatibility. From the inside out, the 2019 Volvo XC60 relays subtle shapes with dramatic impact. The 2019 Volvo XC60 now may be in the middle of the automaker’s crossover lineup, but it slots in at the top of our list for looks. The interior scales down Volvo’s minimalist interior with soothing shapes and oozes calm. Some design features like the available driftwood strip through the dash, are achingly simple and just as effective. It lacks the imposing features found on the XC90, largely because the XC60 is just cozier. A portrait-style touchscreen is planted in the dash sets the XC60 apart among its rivals—the Volvo makes more sense. From the outside, the XC60 moves closer to its rivals with smoothed over shapes that aren’t as tall or steep as Volvo’s largest crossover. The XC60 shares the slim, hammer-style headlights found on most Volvo models that frame the sharp grille. Volvo pulls out all the tricks to make the XC60 taller than its 65 inches would indicate, from the high grille and tall taillights at the rear. Three engines and one new powertrain configuration for the 2019 Volvo XC60 keep it adequately powered and comfortable. 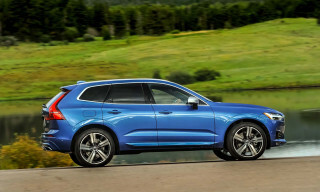 This year, the 2019 Volvo XC60 adds a front-wheel drive configuration to its base powertrain to appeal to sunny state buyers. We haven’t yet driven that version, but we’re not sure it’d spoil our good feelings about the XC60’s engine lineup. The XC60 boasts a trio of powertrains built from a shared foundation. The entry-level engine, dubbed T5 in Volvo speak, is a 2.0-liter turbo-4 that makes 250 horsepower and is the only engine available with front- or all-wheel drive. The next step up for the XC60 is a supercharged and turbocharged 2.0-liter inline-4 that makes 316 hp, called T6. It’s available only with all-wheel drive and accelerates the XC60 up to 60 mph in 5.6 seconds. At the top, a plug-in hybrid T8 mates the supercharged and turbocharged 2.0-liter inline-4 to a 10.4-kwh battery and 87-hp electric motor for a total system output of 400 hp. The XC60 is rated for an electric range of 17 miles, and Volvo estimates that charging the crossover on a common Level 2 home charger would take about 4 hours. Regenerative braking in the T8 versions is a rare lowlight; we’ve noticed a somewhat spongy brake pedal that feels less than natural. All XC60s shift power through a standard 8-speed automatic that’s seamless and unobtrusive. Most of our experience in the XC60 has been behind the wheels of T6 AWD versions that find power early in the rev range and settle quietly to hum through miles. 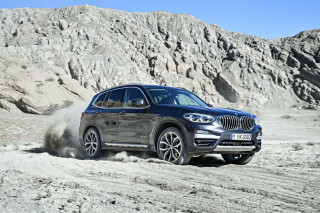 The same powertrains are found in the XC90, although we like the XC60 application better. Behind the wheel, the engines are less thrummy in the XC60, less taxed to move the prodigious weight attached to three rows. Toggling the drive selector modes through Economy, Comfort, and Dynamic changes throttle and transmission responses in predictable ways—Comfort is the happy medium between relaxed and nearly jittery. The drive selector also changes the suspension setup in all but the base steel spring suspension, which is comprised of double wishbones in front, and integral-link and transverse leaf spring rear. The optional air suspension raises or lowers the XC60 for better aerodynamics or better off-road clearance, depending on situation. Economy cuts boost to the air dampers and power steering to add heft to the wheel. Comfort adds creaminess to the dampers and steering that’s truth in advertising. Dynamic puts heft back into the wheel, cuts the stop/start for the engine, stiffens responses and helps the XC60 track down smoother roads. For the rare occasions that the Volvo scrambles up a mountainside, the off-road mode slightly increases ground clearance, engages hill-descent control, slows throttle and steering responses to better stalk through off-road passages. Plug-in hybrid T8 versions get battery conservation modes or charge modes to maintain or recharge batteries. 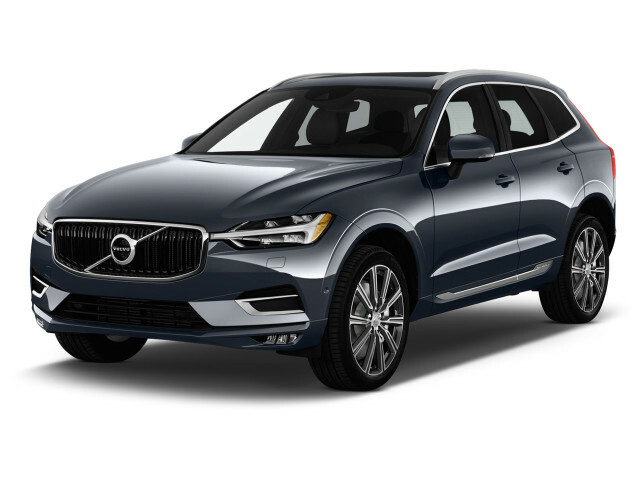 The 2019 Volvo XC60 is a luxury crossover that feels special to driver and passenger. Luxury touches in the 2019 Volvo XC60 don’t ruin the crossover’s primary mission: comfortably hauling people and cargo. 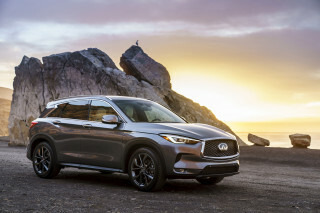 Despite measuring 5 inches shorter than the XC90, the smaller crossover still agreeably holds five people (four is better) with room in the back. By the book, the XC60 measures 184.6 inches from snout to stern and rides atop a wheelbase that’s 112.8 inches long. Front seat passengers tuck in neatly to seats that are comfortable, without being bulky, and sharp when dressed in leather. Volvo’s long-running reputation for quality seats is deserved, they’re all-day comfortable according to our backsides. The center console in the XC60 is lower than in the XC90 and although the cabin is more intimate, it’s not cluttered with knobs or buttons unlike some competitors. Rear seat passengers aren’t left in the cold—figuratively and literally. Available four-zone climate control means every outboard position can have its own subclimate (mostly) and available heated rear passenger seats are delightfully Swedish. Two fit comfortably in the back, while three adults can ride abreast for short distances. We’ve had enough room to carry 6-footers behind other 6-footers without horsetrading for space. With the seats up, the XC60 carries 29.7 cubic feet of cargo space with the seats up, 50.6 cubic feet with the seats folded down. The Volvo XC60 epitomizes the automaker’s efforts to push further upmarket to challenge established luxury rivals. Most surfaces are soft to the touch, and spendy add-ons such as nappa leather, high-end audio, and a crystal gearshift knob look the real McCoy. The 2019 Volvo XC60 earns top safety marks with standard advanced safety features and excellent optional upgrades. Official crash data for the 2019 Volvo XC60 isn’t yet complete, but what’s in is good. The IIHS calls the XC60 a Top Safety Pick thanks to “Good” scores on the crash tests it has performed and a “Superior” rating for its automatic emergency braking. In addition to good active safety features on every XC60 that include forward-collision warnings with automatic emergency braking, lane departure warnings, a rearview camera, and road sign recognition, the Volvo crossover offers optional advanced safety features that can help reduce driver fatigue. When equipped, Volvo’s Pilot Assist suite can steer the car alone for short periods in traffic or on long trips, maintain a safe following distance, and keep the crossover centered in its lane. Other optional safety extras include a surround-view camera system, parking sensors, and blind-spot monitors. The Volvo XC60 is equipped with airbags for all belted passengers and a rear collision notification system as standard. Outward vision is generally good in the crossover, despite thick rear roof pillars. The 2019 Volvo XC60 should be near the top of any luxury crossover shopper’s list. This year, the Volvo XC60 adds a base, front-drive version that reaches temptingly close to $40,000—approaching affordable for a luxury crossover. The 2019 XC60 is available in three trim levels: Momentum, R-Design, and Inscription that add increasing creature comforts and/or sporty trim appointments. The base Momentum versions are hardly spartan. For $40,195 to start, including destination, base XC60 T5 FWD Momentum crossovers are equipped with leather upholstery, power-adjustable front seats, 18-inch wheels, keyless ignition, Bluetooth connectivity, a power liftgate, premium audio, and a 9.0-inch touchscreen for infotainment with Apple CarPlay and Android Auto compatibility. Combined with standard active safety features such as automatic emergency braking, active lane control, and road sign recognition, base versions are our picks for best value. Top Inscription trims add a digital driver information display that replaces the gauges, 19-inch wheels, four-zone climate control, navigation, and driftwood trim for more than $47,545 with the base engine. A higher output turbo-4 is available on all trim levels for roughly $3,400 more and is exclusively paired to all-wheel drive. A plug-in hybrid powertrain adds an additional $8,000 to any trim level. Volvo bundles most of its options into packages that can add a suite of driver-assist features that can keep the car centered in its lane or even drive it for short distances in stop-and-go traffic, premium audio, an air suspension, or bigger wheels. The 9.0-inch touchscreen for infotainment is standard in all trim levels and is one of our favorites to use thanks to its vertical orientation, easy-to-follow menus, and embedded Apple CarPlay/Android Auto compatibility. When equipped with navigation, it makes even more sense. We’re not sure why other automakers haven’t followed Volvo’s lead. The 2019 Volvo XC60 is surprisingly thirsty, even the big V90 wagon does better. The big news this year for the 2019 XC60 is an available front-wheel driver that incrementally improves fuel economy. The bright side? All-wheel drive doesn’t ding fuel economy too much. The XC60 T5 AWD rates 20/27/23 mpg, according to the EPA. The higher output XC60 T6 AWD rates 19/27/22 mpg. The most fuel-efficient version of the XC60 is also the priciest. The XC60 T8 plug-in hybrid is rated at 26 mpg combined, and has an all-electric range of 17 miles when its 10.4-kwh battery is fully charged. Opting for that powertrain adds roughly $14,000 to the base price of a 2019 XC60. All XC60s are designed for premium fuel.